Early Renaissance painting began to strongly apply to the territory of Slovakia in the late 15th century. An important impetus for the dissemination of the principles of the Italian Renaissance in our territory was the courtly life of King Matthias Corvinus (1458 – 1490) in Buda, whose reconstructions were performed from the late 1570s century by several Italian builders, who especially presented Florentine Renaissance typology. The Renaissance style was mainly manifested in Slovakia through architecture. Its development was focused on new buildings, mainly secular buildings and churches to a lesser extent. Painting focused on the new role of architecture – it particularly excelled in the sgraffito decorations of facades for prestigious buildings, sporadically interior murals and very seldom examples of portrait or altar painting. Unique are the painted decorative facades in Banská Štiavnica (homes no. 8, 14, 15 at Trinity Square), which is iconography touching on secular-sacred mythology and the experiences of social life. Likewise, sgraffito painting developed in some eastern cities – Prešov, Bardejov, Levoča and Košice. Renaissance paintings of this type include allegorical figures of virtues on the southern facade of the town hall in Levoča (second half of the 16th century) and the more challenging processed figural painting in Levoča (house no. 44). In the illusive compartment area there are shown the figures of St. Anna Metercia, St. Sebastian and St. Christopher. A specific genre of Renaissance painting were painted epitaphs and painted decorations on compartment ceilings. In Spiš the painters created the unique epitaph of Imrich Czobor crowned with the Assumpta from Skalica (circa 1520). 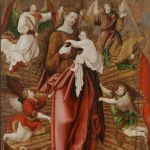 This rather large slab of Early Renaissance painting is stored in the collections of the Slovak National Gallery in Bratislava. It comes from the Franciscan monastery church in Skalica. Later there was the Epitaph of Petronela Zmeškalová of the parish church in Brezovica (from 1600), whose authorship is attributed to the painter Jacob Khiel, working in Banská Bystrica. The decoratively rendered and rustic form of rural Renaissance painting was applied in the decoration of the wooden coffered ceiling of some rural churches in the Orava region. An exceptionally sophisticated painting is the ceiling of the church in Dolná Lehota in 1627.